Standard model that enables you to easily enjoy high performance. A choice of 4 elegant colours. Records natural 360° still images and videos with high resolution and highly precise stitch image processing. Never miss a shot with the quick lens response that enables shooting in around 1.5 seconds after turning the power on. To enable everyone to easily enjoy 360°. Designed to easily fit in your hand without slipping. A choice of 4 elegant colours. Thin and lightweight body that optimises internal components using a proprietary folded optics system. Fully experience virtual reality using commercially available VR viewer. Use the dedicated editing app “THETA+” to easily put the finishing touches to eye-catching work. Use the dedicated apps from anywhere to easily share your work with people all over the world. Upload to theta360.com, a website dedicated to sharing 360-degree images. Anyone can easily display their 360° images anywhere in the world. Convenient dedicated apps are available for both the PC and smartphone. 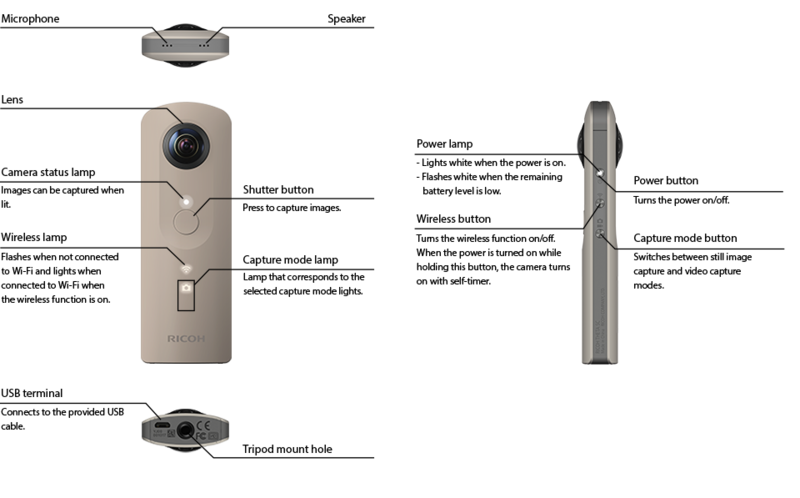 Enjoy the world more with RICOH THETA. Facebook and LINE so 360° photos can be uploaded as is. Easily share the 360° world with friends. Post images and videos processed using “THETA+” to Instagram and Twitter. *2 Charge the battery by connecting it to a PC using the supplied USB cable. *3 The number of photos that can be taken is a guide based on RICOH's measurement method (wireless on, one photo taken every 30 seconds and transferred to smartphone). The actual number differs according to usage conditions. *5 A smartphone is required to change modes or configure manual settings. *6 Automatic shut down if the internal temperature increases. 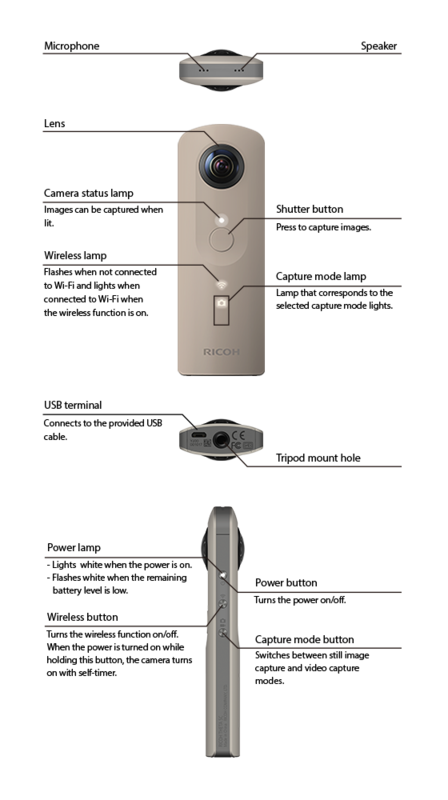 *8 When you mount RICOH THETA on a tripod or some other accessory, it may interfere with the cable that you insert into the terminal on the camera. If that happens, we recommend that you use the TE-1 Extension Adapter. *9 You need to update to the latest firmware. ■Specifications and the design may change without prior notice. ■Specifications are current as of December 2017.